Are you thinking about sprucing up your indoor space with some beautiful and fragrant flowers? 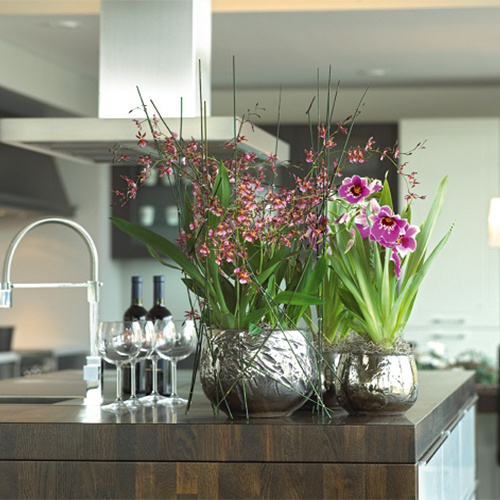 Indoor flowers have the power to completely transform a bland space into a lively and comfortable living area. Most of us are used to gardening outdoors and limit our flowers and plants to our back and front yards. Did you know that many flowering plants could also be grown indoors? There’s nothing better than a splash of colorful arrangements in your home to brighten up a gloomy day. Flowers and plants also don’t have to be constrained to decorative pots with soil in them, there are various creative ways you can arrange your indoor flowers and plants. Apart from the various benefits that come along with plants and flowers, the planting itself is also an enjoyable activity. Who would have thought that indoor flowers could actually be considered as a part of the overall design and dÃ©cor of your home? In order to add some color to your home and brighten up your surroundings, consider indoor flowers for decorating your space. Here are a couple of indoor flower decoration ideas that will surely bring a beautiful and refreshing effect to your home or office space. Instead of planting your indoor flowers in the usual decorative pots, consider putting them in something unexpected such as a glass jar or bottle. You can fill up the glass container with layers of decorative stones or moss to keep the soil moist. This also adds an extra touch of style to the decorative arrangement. A repurposed mason jar, wine bottle or a plain glass vase will spotlight your indoor flowers and add some elegant drama to your home all in one. Succulents are perfect for glass containers, because you can style them into mini beach or desert landscapes. Conceal the tiny pots with sand and add decorative starfish, coral and stones to create a beautiful arrangement, which honors these drought tolerant plants. Air plants absorb most of their nutrients through their leaves in the air, so they don’t need a lot of soil. Since they don’t need to be potted in a lot of soil, it’s only natural to display them in decorative suspended orbs. Hanging Terrarium’s make wonderful miniature gardens that you can hang in your office, kitchen, laundry room or any other space in your home. Not only are these plants fairly easy to care for, but they also add an elegant charm to the space they inhabit. If you’re visiting the supermarket to pick up groceries, you can also pick up some cheap flowers that you can plant and decoratively arrange at home. African violets, tulips, lavender or whatever your choice of flower is, you can easily create a pretty arrangement as a decorative piece for your living room or breakfast counter. Gather your flowers of choice and cover the roots with sheet moss to efficiently hold in moisture and create a cozy environment for the plant. Orchids are unique flowers that are well known for their beauty and symbolism of love. They vary in colors and shapes, emit a delicious fragrance and they exude luxurious elegance in every space. Orchids are used for centerpieces at fancy events, corsages for weddings and proms as well as a simple arrangement on a dining room table. Many people believe orchids to be difficult to take care of, but this is actually not the case. Orchid care is not difficult, it’s just different, and all they really need is to stay hydrated and some indirect sunlight to stay happy. These beautiful flowers don’t need much to stay happy, however when they are in bloom they add beauty and serenity to every space in your home. If you want to incorporate indoor flowers into your home decor, but you are not sure about picking the right flowers and how to care for them, then don’t fear because that is what we are here for. Interior Gardens offers the highest quality plants and orchids for interior home decoration along with top-notch customer service. Our expert team will evaluate your space and offer personalized recommendations based on your wants and needs. Once your plants and flowers have been installed, our team will visit to make sure your newly acquired arrangements are thriving in their new environment. If you have any questions about indoor flower decoration or about Interior Gardens, don’t hesitate to contact us. We look forward to assisting you with all your decorative plants and flowers.